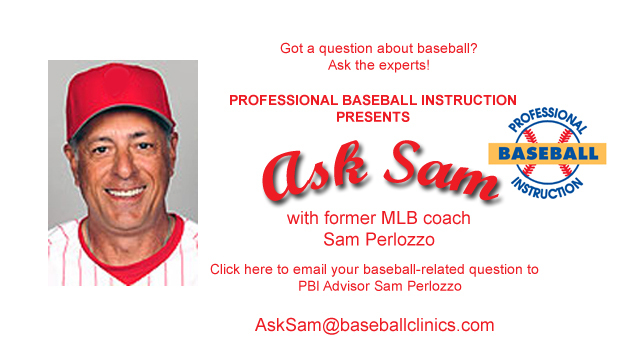 Former major league manager and coach, and PBI advisor Sam Perlozzo periodically answers your baseball-related questions. Email Sam directly – AskSam@baseballclinics.com. Here’s the latest from the “Ask Sam” mail bag. A: Hey John, that is a very good question about how long your stride should be. Interestingly enough, since I am not a pitching coach, I very well could have asked you the same question! As luck would have it, I just did some filming with a current well-known pitching coach who happened to be covering that same topic. What I would have told you prior to listening to him would probably sound like this – “John, I would say whatever looks comfortable, feels comfortable, not too short and not too long.” Pretty vague right?! Right. Let me prep you before I give you the real answer. Major League Baseball has been changing drastically the last 10 years, talking about numbers, physics, etc. The emphasis seems to be more heavily on that sort of data to find better ways to do things, healthier ways to do things, and better your strategy. Not just from management’s sector, but also players. There is so much information out there that it seems sometimes we are creating robots!! So what I’m hearing, finally, is the answer to your question. The stride depends on the player’s height. The gurus are telling us the the stride length should be anywhere from 75% to 85% of the player’s height. So if a player is 6 feet tall (72 inches), his stride should be between 54 inches(75%) to 61 inches (85%) long. So that seems to be a general run of thumb these days and I would say is to also factor in some common sense. If your son or daughter feels very awkward at specific stride lengths, just experiment some. Ultimately, the hitter’s response to the pitch is the biggest sign the something needs to change somewhere. A: Marie, thank you so much for that question. I can’t tell you how many times I’ve hear people ask me about the same thing. I think the most important thing we need to focus on is where we are in your son’s stage of development and growth. Many years ago, the traditional shortstop was a defensive wizard with the glove, fairly quick, and usually one of the team’s weaker hitters. That has really changed over the years. The game has evolved into a more offensive-oriented game. Teams and fans want to see runs scored, home runs, players running all around the bases! But that is not to say we want to give up defensive skills along the way. The standard answer was that the corner infielders were the bigger guys in the infield and the most prolific hitters. But gradually the game became open to bigger players playing in the center of the diamond. When I was with the Orioles, we had Cal Ripken. I’m not sure if you’ve ever stood next to Cal, but I have. It was then that I realized how big he was….or how small I was! I also had Alex Rodriguez when he first came into the big leagues as a shortstop. And he is a big guy, too. If I were you, Marie, I wouldn’t fret too much just yet. Not knowing your son or the team’s makeup, I would venture to say the coaches are trying to get all the best players on the field at the same time and it just so happens that in order to accommodate, they have moved your son to a corner position. I would tell you this – have your son play as much shortstop as he possibly can. The skills to play that position are very unique. Shortstop is the action position and kids can develop and learn by playing there. Sounds as if your son has plenty of time to prove himself at this age. There is plenty of time to move to a corner spot. I always suggest to parents and kids alike, play there till there is no other alternative. The experience from playing there will be tremendously helpful, especially if he has to move to 3rd or 1st. A: Larry – Leo and I have shared so many moments together, half of which we both would probably want to forget!! Just kidding, but we have done a lot together. Most people don’t realize that we grew up in the same area, worked or played the same game, had the same yearly schedule, so you can imagine the stories we could tell. Let me give you some background. Leo went to Bruce High school and I went to LaSalle one year and Bishop Walsh the remaining three years. He was three years ahead of me. I hit off him as a freshman in HS while he was a senior. I didn’t fare too well. But as we grew older the things began to draw us closer together. We were players in the minors, coaches in the minors, and then coaches in the majors. All at the same time, coming home in the winter to talk baseball, cut wood, and shovel snow. We would get together, talk baseball all the time. Couldn’t wait for the snow to melt and feel the warmth of the green grass at spring training in Florida. As the years unfolded, we would occasionally end up in the same leagues facing each other. Neither one of us wanting to give in on the win-loss column. As it turned out, I would ask him about my pitchers, what he saw that could make them better, and then watch him glare at me the next time we played, as he watched my new-found pitcher mow their guys down!